A young boy with stunted growth is convinced that God has a great purpose for him. 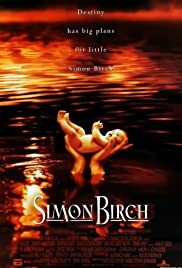 Q: What did John Irving think of Simon Birch? This film is a coming of age piece about a young man with obvious disadvantages that would have beat down most people. Yet he manages to find God's plan for him while showing those who doubted him that he had the right stuff all along. There are other subplot misdirections but that is the main thrust. Ian Smith, who plays the title lead, is very small in stature, but he has giant talents. I'm surprised he hasn't been cast in other films yet. An engrossing, sometimes funny and sometimes sad film that I found to be remarkably well made. Everyone involved should be proud of it. One of the better little films I've seen lately and frankly it is better than some major films release lately. Very pleasantly surprised when I stumbled onto it on WGN and plan to view it again uninterrupted on DVD as soon as I can. Why haven't I heard of this film before? An excellent screenplay, skillful direction, plus tight period music, art direction and wardrobe add up to a great early 60's feel. Natural editing, good casting, clear sound even during the big exciting scenes show this to be a well made film all the way around. This is a film for adults about guys growing up physically and emotionally. This is not suitable for children under 18. Not because there is something they shouldn't see in this movie, but instead because they just won't get it. I saw it last night and I'm still chuckling to myself now and then about the Christmas play scene. Thanks to all involved for making a really, really good movie! It has some laughs, but also made me stop to question what God's plan for my life might be. It restored some of my faith that He does have a plan for those of us who are willing to give Him a chance to lead us to our opportunity to become His instrument. If none of that makes sense to you, you haven't seen this movie!